Eastern Hulafish, new captive-bred reef fish native to New South Wales, Australia. Image: ORA. This sub-tropical species is from New South Wales off southeastern Australia and is related to the Assessors and Comets, all in the family Plesiopidae. Shoal of juvenile Eastern Hulafish at Oceans Reefs and Aquariums, Ft. Pierce, Florida. 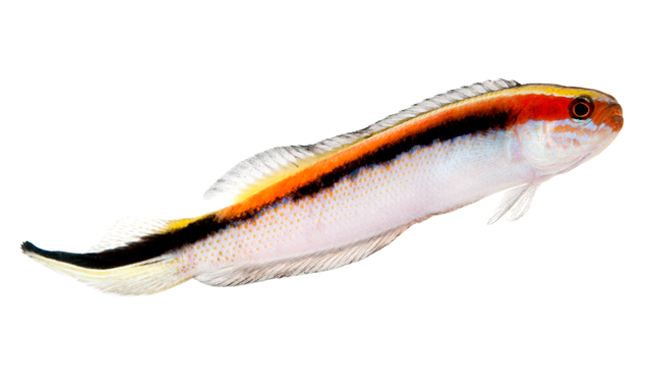 They are very colorful fish with a black stripe running down the middle of their elongate body from the operculum towards the tail. They are red and yellow above the black stripe and their ventral portion is white. Some have iridescent blue scales on the face. As they age, their caudal fin grows into a spade shape, with the males having more exaggerated filaments. 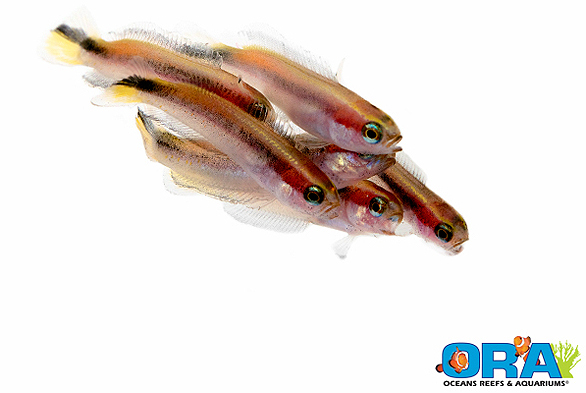 These are shoaling fish, and ORA recommends keeping them in groups of 4-5 or more. When kept in groups these fish exhibit a unique swimming behavior, hovering at an angle which is said to suggest a cluster of hula dancers. Trachinops taeniatus grow to a maximum size of about 4 inches (10 cm) and are micropredators, eating small food items such as copepods, Artemia, Mysis, small pellets and flakes for carnivores.